Conax Technologies' High Temperature Thermocouples are specifically designed for durability and reliability in high temperature applications to 4200° F (2315° C). Such applications generally involve oxidizing, reducing, inert gas or contamination atmospheres that challenge the life of the thermocouple. Conax has many years of experience in the design and manufacture of thermocouples with materials and designs to maximize the life and reliability of thermocouples in these environments. The primary characteristics of materials used in thermocouple types, sheaths, and insulations are outlined in our standard configurations below. Our high temperature thermocouples are specifically designed for durability and reliability in high temperature applications to 4200°F (2315°C). Such applications involve oxidizing, reducing, inert gas or contamination atmospheres that challenge the life of the thermocouple. Choose the thermocouple type from the temperature range table below. Minimum requirements for all Conax Technologies thermocouples are standard limits of error and are denoted by a single letter (eg. S). Special limits of error are also available and are designated by a double calibration letter (eg. SS). ① Formerly Conax Technologies Type W5, Type C not an ANSI official designation. * Upper Temperature Limits per ASTM E230 for 24 AWG wire for Types S, R and B. * For Type C, special limits of error wire is not available (ref. ASTM E988). * Platinum calibration not recommended for direct immersion in vacuum atmosphere, use with protection tube. (2790°C) Hafnium oxide is usually present in zirconium ores in amounts ranging from .5 to 2 percent. Refined high-purity hafnia offers a higher electrical resistivity at elevated temperatures than yttria or zirconia. Hafnia’s resistivity is comparable to that of beryllium oxide, but hafnia does not present the potential health problems associated with beryllium oxide. Hafnia is therefore replacing beryllium oxide in many applications. Hafnia is the commonly recommended insulation for Conax Type C thermocouples. (2610°C) Molybdenum offers excellent mechanical properties at elevated temperatures and is exceptional for use in reducing or neutral atmospheres. Molybdenum offers superb thermal shock resistance and has potentially unlimited life at high temperatures in a vacuum. Pure hydrogen, argon and helium atmospheres are completely inert to molybdenum. Performance is poor in oxidizing atmospheres. Above 800°F (427°C), molybdenum will react with oxygen. depending on temperature and oxygen content. (2996°C) Tantalum is best used in reducing or neutral atmospheres and in a vacuum environment. Its performance is poor in oxidizing atmospheres, and it must be protected from gases such as oxygen and nitrogen at temperatures above 570°F (300°C). Tantalum is outranked by tungsten for high temperature strength. Tantalum is excellent for thermal cycling applications and is the most corrosion resistant of the refractory materials. It is almost completely immune to attack by acids except hydrofluoric acid. (2030°C) High-purity aluminum oxide offers high thermal conductivity, high electrical resistivity and good resistance to thermal shock. It also offers excellent resistance to chemical attack. Aluminum oxide functions well in oxidizing, reducing or high vacuum applications, but is not recommended for high vacuum environments in the presence of graphite at temperatures exceeding 2372°F (1300°C). ② Molybdenum, Tungsten and Tantalum sheath assemblies are backfilled with argon and sealed to prevent oxidation. Standard polarized plug and jack termination for use with all calibration types. Plug and jack assemblies are made from molded glass filled thermoset compounds and are designed to operate in temperatures to 300° F (150° C). Polarity identification marks are molded in the bodies for installation assistance. An adjustable support tube offers flexibility for immersion adjustment while protecting the sheath from potential damage during installation. The rigid, thick wall offers additional support when penetrating the vessel/furnace wall. 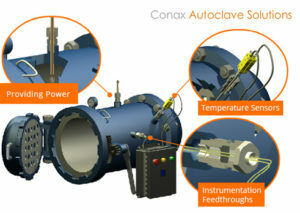 This exclusive Conax Technologies design provides a practically unbreakable connection between the leadwire and probe lead. The T3 epoxy-filled transition is supplied with PTFE-insulated extension wire as standard; silicone-impregnated fiberglass insulation is also available. Standard extension end leads are 24" long (longer leads available on request). When the progressive description specifies 24 gauge probe wire, 20 gauge extension wire is standard. When the progressive description specifies 30 gauge probe wire, 24 gauge extension wire is standard. T4 termination provides a stainless steel overbraid for maximum flexibility and abrasion resistance. Available in all sheath materials and wire types. Both termination types function to 300° F (150° C) continuous temperature. Conax Technologies provides high temperature assemblies with T5, T8 and T11 termination heads in aluminum, stainless steel or cast iron to meet application needs. T5 termination heads meet NEMA 4 requirements providing protection against windblown dust and rain, splashing water, hose-directed water and external ice formation. The sheath is affixed to the terminal head using a Conax Technologies packing gland Type PG4 with lava sealant. 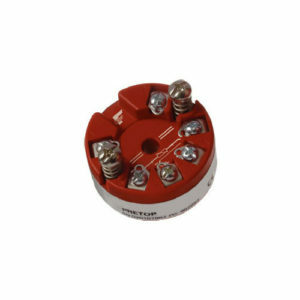 Terminal heads with terminal blocks and gasket seal are rated to 275° F (135° C). The direct mount style features a B Cap with .50 NPT mounting. At temperatures above 2012° F (1100° C), graphite dust from graphite liners/shields or heating elements can attack and carburize molybdenum sheaths. This causes the sheath to crystallize and become porous, losing its protective properties. The thermal elements in turn crystallize and open. Coating the heat-affected length of the molybdenum sheath with a thick layer of tungsten reduces this carburization action and extends probe life. The tungsten coating also provides increased abrasion resistance.